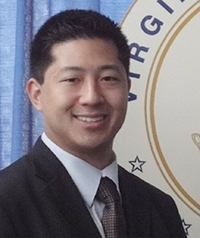 Edwin J. Wu, an Assistant Public Defender in Portsmouth, has been named the recipient of the Virginia State Bar Young Lawyers Conference 2014 R. Edwin Burnette Jr. Young Lawyer of the Year Award. The award recognizes a young lawyer who demonstrates dedicated service to the conference, the legal profession, and the community. It is named in honor of Lynchburg Judge R. Edwin Burnette Jr., past president of the VSB (1993-1994) and the YLC (1985-1986). The award will be presented on June 13, 2014, at the Virginia State Bar Annual Meeting in Virginia Beach. Wu has been a member of the Portsmouth Public Defenders Office since September 2013. He is also an adjunct professor at Norfolk State University where he teaches business law and federal income taxation to undergraduate students. Christopher R. Fortier, the recipient of last year’s award, praised Wu for his work on organizing the Professional Development Conference in Virginia Beach and for implementing the Minority Pre-Law Conference at Regent University School of Law. Over the past year, Wu volunteered at the Legal Aid Society of Eastern Virginia and the Community Tax Law Project. Wu also assists with the Volunteer Income Tax Assistance program that provides free tax preparation services to the military and the community.